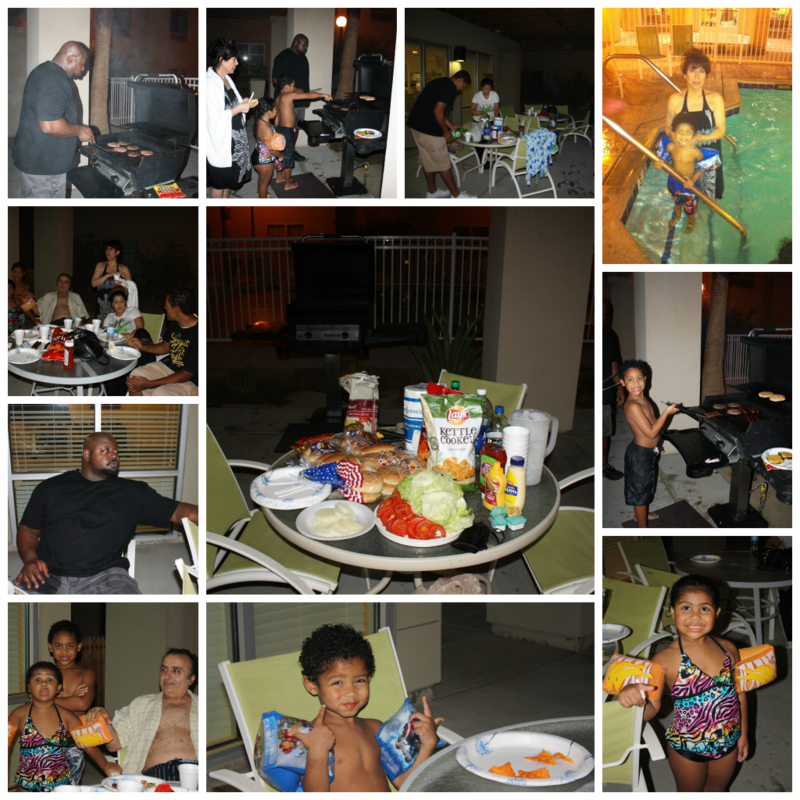 With school starting an entire month early this year, we were delighted to schedule a trip to Palm Desert to celebrate the end of Summer. 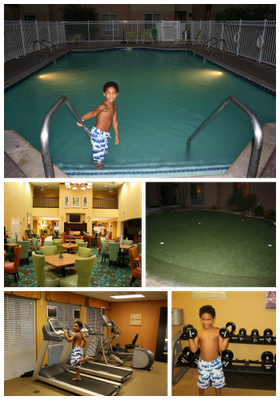 We stayed at the Homewood Suites in Palm Desert and were even more delighted when my parents agreed to join us! When we arrived it was about 115 degrees so we couldn't wait to get inside and relax. 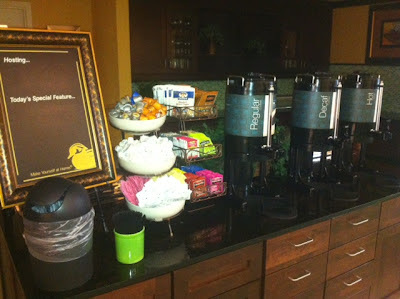 The first thing I noticed upon check-in was the most wonderful thing I have ever seen and something I will remember forever...COMPLIMENTARY COFFEE!!! (as well as tea, hot chocolate & oatmeal) Seriously, their delicious brew of the good stuff is just sitting there out in the open, fresh and ready to be consumed by the likes of ME! I knew this was going to be great trip! After about a couple cups of coffee, I was ready to walk around the hotel and check out the amenities. My two youngest kids decided to stay in the room while Jackson and I went for a walk. We found the pool, the putting green the main sitting room where breakfast is served daily and the gym. 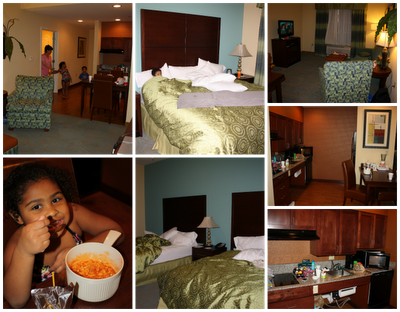 The rooms are very nice and perfect for a family vacation. We had a two bedroom suite which includes a full kitchen with full size fridge. This is a necessity in Palm Desert. We kept our fridge stocked with water, juice, fruit and the freezer had an ice maker which was awesome. The kitchen has a microwave, stove and dishwasher. We made a lot of our own meals in the room which was perfect for after swimming. 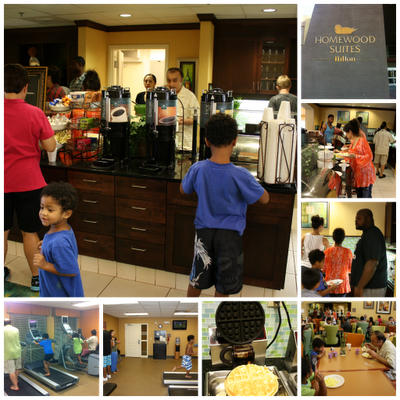 We woke up and enjoyed a complimentary breakfast every morning of our stay. My favorite part was the make-your-own-waffle station! My waffles were perfect! In the evenings we would work off all the food we ate in the fitness center. My kids really enjoyed working out as a family. 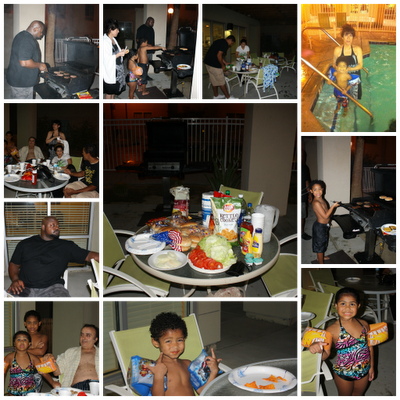 On our last night we decided to go out with a bang so we had a family BBQ by the pool. Yes, it was hot out, but the kids loved it. We swam for a bit while Dad got the grill going. Then it was time to feast. Homewood Suites even provided all the necessary grilling tools so all we had to do was buy groceries. We had a wonderful family staycation and the kids will remember this trip for a long time to come. 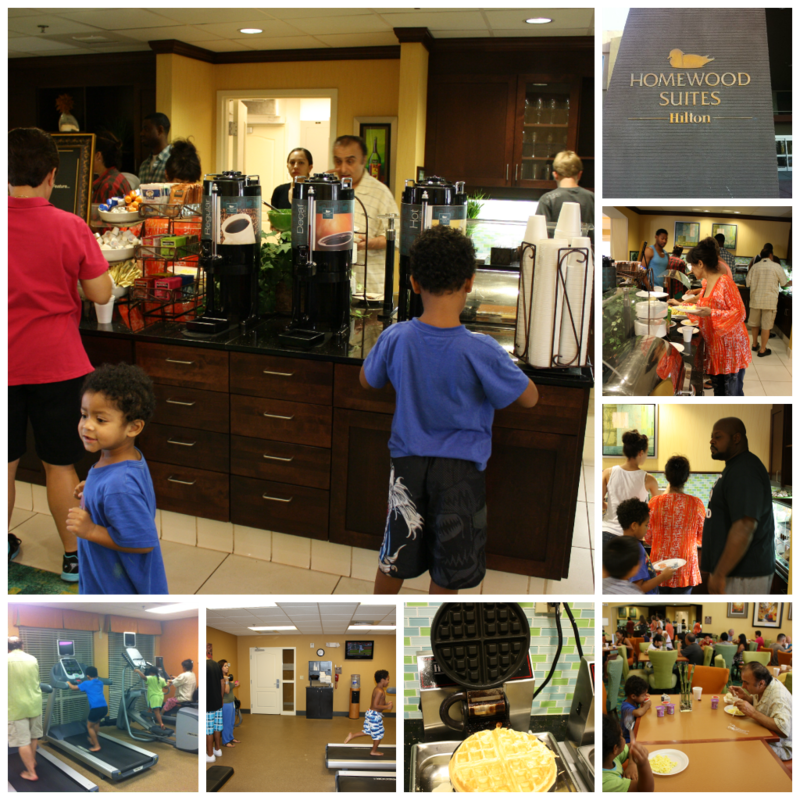 Thanks to Homewood Suites for having us. The staff was amazing! Disclosure: I was not compensated for this post. I was offered a Media Rate in order to facilitate my review. These are just my two cents! WOW, so much fun! Love the HUGE room! Looks classy and comfortable! Nice combo! I was looking for blog posts about things to do in Palm Desert to share on our site and I came across your post...If you're open to it, shoot me an email at jane(at)dwellable(dot)com.